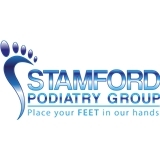 Stamford Podiatry Group PC (Stamford) - Book Appointment Online! We are a full service Podiatry office attending to all types of foot and ankle injuries. Our services include, but are not limited to Bunion deformities, hammer toes, ingrown nails, warts, nail fungus, athletes foot,sprains, neuromas, diabetic feet, flat feet, heel and arch pain. Our doctors are all Board Certified in foot surgery, and have greater than 30 years combined experience of practice. On site x-rays and diagnostic ultrasound on premises. Emergencies welcome..."place your FEET in our hands"